Jaguar Sequential Shift combined with the ZF® 8-speed automatic transmission in all XJ models provides smooth yet quick gear changes, and uses adaptive shift technologies to vary transmission operation. It offers a choice of Drive or Sport Mode, depending on your driving style. In addition, one-touch paddle shifters mounted behind the steering wheel allow for manual gear-selection, as you desire. The JaguarDrive Control™ system on every XJ model features Winter Mode, a sophisticated setting that is designed to help maintain traction on snowy, wet roads. When activated, Winter Mode transforms the way the XJ responds: The engine, transmission and Dynamic Stability Control work together to help avoid slipping and skidding in adverse weather conditions. When activated on models with Instinctive All Wheel Drive™, Winter Mode changes the default torque split to 30/70 front/rear. Even the windows and mirrors on the XJ are a cut above. The car’s glass is laminated to reduce exterior noise and solar glare. The rear window and exterior mirrors can be heated to eliminate condensation or frost. And when the sensors on the windshield detect the first drops, they instantly activate the wipers at the appropriate speed. Look closely at the XJ. 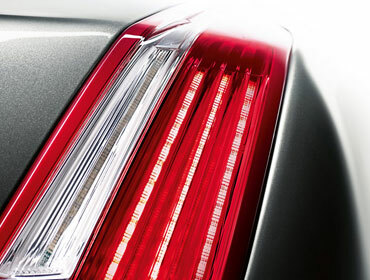 Unique details enhance its coupe-like profile and flowing lines with striking signature styling cues, such as the cat’s claw rear LED light clusters. 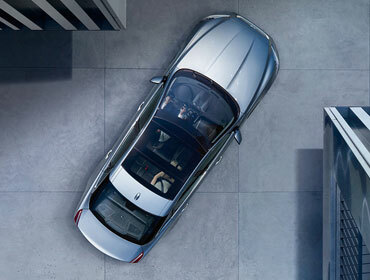 The airy, spacious yet private XJ cabin area is enhanced by the panoramic, heat-reflective tinted glass roof. It extends to the full width of the car and sweeps as far back as the rear seat area, filtering UV rays and flooding the interior with natural light. In addition, the black roof pillars create the impression of a floating roofline, emphasizing the long, low and wide profile of the XJ. Switches mounted on the steering wheel control the entertainment system and cruise control, and engage Interactive Voice™, which accesses the latest voice recognition system for many functions, such as destination entry, phone calling or radio tuning. The system is fully integrated with the Virtual Instruments, which display driver input and selections. Adjust the environment to suit you and your passengers with dual-zone or available four-zone automatic climate control. Both systems include air-particle and odor filtration, humidity control and automatic window defogging. Comfort comes from control. Convenient steering-wheel controls allow you to manage frequently used functions via the Virtual Instrument menus without taking your hands off the wheel or even looking at the Touch-screen menus. Additional controls below the steering-wheel spokes operate cruise control, Bluetooth® telephone connectivity and Interactive Voice™ functions. 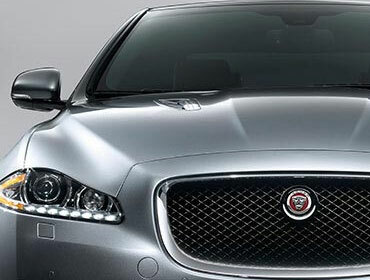 And for extra comfort on cold mornings, the XJ offers the added luxury of a heated steering-wheel rim. A soothing Phosphor Blue glow lights your way inside the XJ. This soft shade is both practical and pleasing, from center console, door panniers and door pulls to the illumination of the analog clock. And with a light touch, you can open the glovebox or turn on the overhead console lights, thanks to JaguarSense™ technology. The reinforced XJ body shell is engineered to protect you and your passenger if the unforeseen occurs. Its aluminum body panels and monocoque chassis are chemically bonded and riveted together to produce an exceptionally strong and rigid shell. For extra safety and convenience, when reversing, the Reverse Park Camera displays the area behind the vehicle on the central Touch-screen. Guidance lines, indicating the area into which the car will reverse, help in assessing space and potential obstacles. For added confidence while changing lanes on highways, the Blind Spot Monitor uses radar sensors to alert the driver of vehicles that may be hidden in the blind spot. An orange icon in the appropriate external mirror illuminates when a vehicle is detected.